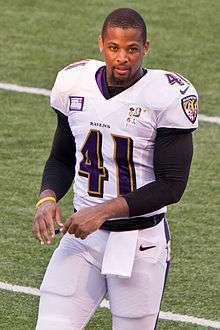 Anthony Levine (born March 27, 1987) is an American football linebacker and safety for the Baltimore Ravens of the National Football League (NFL). He played college football at Tennessee State. Levine spent the first 14 years of his life in Abbeville, Louisiana. Before high school, he moved to North Carolina where he played both football, basketball, and track while he attended Richard J. Reynolds High School in Winston-Salem. Levine helped the Reynolds Track Team win the North Carolina State Championship his senior year. Levine was signed to the Ravens' practice squad on September 3, 2012 and was promoted to the active roster on November 17, 2012. He was placed on injured reserve on November 26, 2012 after his first NFL game in which he recorded one special teams tackle. He is the cousin of former NFL player Brandon Mitchell. He is the son of Christina Levine and Lawrence Brannon. Levine has three sisters Alisio Levine (who was the former Miss Abbeville 2010), Cassie Brannon, and Angelle Brannon. He also has two brothers, Dwayne Levine and Wade Levine, both from Abbeville. ↑ Wilson, Aaron (March 11, 2015). "Ravens re-sign defensive back Anthony Levine to two-year, $2.4 million deal, sources say". BaltimoreSun.com. Retrieved November 26, 2016. ↑ "Anthony Levine". Green Bay Packers. Archived from the original on 25 February 2011. Retrieved 2011-02-07.